After 11 days of sitting at room temperature in a Ziploc bag, this is the photo of the 2 burgers. Obviously, the one on the right is the homemade burger and the one on the left is the McDonald's cheeseburger. This cheeseburger smells the same as when it was purchased. When opened - it showed no signs of decomposition. I will continue to post photos every Saturday on its progress (or lack there of). This cheeseburger had to be tossed out because it smelled really bad. Why didn't the McDonald's cheeseburger rot? Where I get stuck is the word nourishing. 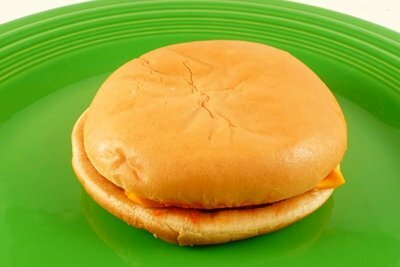 If bacteria or fungi aren't interested in "eating" this cheeseburger, how can it be nourishing to human beings? On a personal note, I used to eat fast food regularly. My university was across the street from a McDonald's and my home in San Francisco was about 100 yards from a Burger King. I'm not sure when exactly it was, but I starting getting bad stomach aches whenever I ate a cheeseburger from a fast food venue. My stomach just couldn't handle the food. At first, I thought it was because of the grease. But, I can eat other really fatty things without a stomach ache. Maybe I am getting stomach aches because my body cannot DIGEST this burger. If bacteria from the air can't digest the McD's cheeseburger in 11 days - how is my intestinal bacteria (along with stomach acids) supposed to digest it in 24 hours? Just a thought. I am asking Micheal Pollan and someone at McDonald's to discuss this experiment with us. I don't know if either will reply - but if we cause enough of a ruckus - I believe we can get some answers. Last week's Tostitos post must have bugged Frito-Lay, a dietician that works for them contacted me. Please forward this blog post to your friends via FaceBook, Twitter, and/or e-mail. Every school science class can do this experiment for $3, and I think it is worth doing. We need to discuss this "food" with our children and our families and decide how it contributes to our overall health. What Happens When You Mix Pepsi and a Hard Boiled Egg? Enriched flour (bleached wheat flour, malted barley flour, niacin, reduced iron, thiamin mononitrate, riboflavin, folic acid, enzymes), water, high fructose corn syrup, sugar, yeast, soybean oil and/or partially hydrogenated soybean oil, contains 2% or less of the following: salt, calcium sulfate, calcium carbonate, wheat gluten, ammonium sulfate, ammonium chloride, dough conditioners (sodium stearoyl lactylate, datem, ascorbic acid, azodicarbonamide, mono- and diglycerides, ethoxylated monoglycerides, monocalcium phosphate, enzymes, guar gum, calcium peroxide, soy flour), calcium propionate and sodium propionate (preservatives), soy lecithin. Milk, water, milkfat, cheese culture, sodium citrate, salt, citric acid, sorbic acid (preservative), sodium phosphate, artificial color, lactic acid, acetic acid, enzymes, soy lecithin (added for slice separation). Tomato concentrate from red ripe tomatoes, distilled vinegar, high fructose corn syrup, water, corn syrup, salt, natural flavors (vegetable source). Oh god! This really creeped me out! I want to know how this ends. Wow...that's...eww! I used to eat fast food all the time as well. My mom used to bring it home 2 to 3 nights a week when I was growing up. Now that I've weened myself off of it, I can't even think about eating it anymore without feeling a tummy ache coming on. I am most grossed out by the bun and meat not decomposing. WHY AREN'T THEY?!?!?! All I can think of is there is so much preservative in them the bacteria can't break them down. When the bun ingredients say '2% or less of the following', does that mean total as ingredients or per each ingredient? There are at least 10 ingredients following that statement(counting the dough conditioners as just 1). Does that mean 2% or up to 20% of the bun contains those ingredients? I get stomach aches too when I eat this stuff and I also used to attribute it to grease. Time to re-evaluate big-time!! GROSS GROSS GROSS!! No more McD's anything for my family ever again! I makes me mad to think of all the kids that will eat these burgers for dinner tonight. Very interesting...Based on this, is it any wonder that American's have so many health issues? I'll be sure to let me readers know about this. Thank you so much for doing this, Lisa. I am so appreciative of your efforts to shine the bright light on what we have turned to as "nutrition" within our unhealthy habits and diets. Brava, lady. You Rock! Wow oh wow. This is disgusting! Really truly something to think about - and I'm staying far away from McD's. Far Far Away! I agree with Laura about there being too much preservative in them to break the hamburger down. It's akin to eating plastic. ICK! I LOVE this post! Fast food is literally killing Americans, yet it is portrayed as being good for you and budget conscious. The average American is totally unaware of the reprecussions of what they put in their mouths, and as the saying goes, "You are what you eat" is so true. I can't tell you how many mothers tell me their kids are sick after eating out at fast food places. You are right, it is not real food in many cases! We must educate ourselves and question everything, just like you did with Tistitos. The companies may not like it, but the truth hurts...our health!! Keep it up and behind you 100%. Is this just MCDs cheeseburgers that do this? Have you tried it with say...Hardees or Checkers or Sonics? I only tried McD's because it is near my house. But, maybe, we should try all of them - it would be fascinating to see if some was real food vs. others. I would LOVE to see how the other major fast food chains compare too. This is pretty gross. I don't eat McDonald's anymore (it was never all that tasty, but now I can't due to a gluten-free diet), but this definitely inspires me to continue to limit my processed food intake. Gross. I'm not too surprised the bun isn't decomposing, but what about the meat? It claims to be "100% beef"... Maybe it has something to do with the fact that ground beef is "cleaned" with ammonia (YUCK!!!) in an attempt to kill the E. Coli. I can't helo put thinking of a food science professor who told us to "buy the ugliest food". She meant food should age, show signs of wear and tear and not look perfect. Your McDonalds burger looks so perfectly ageless I want to throw up. Keep the important posts coming. I will post this one for sure. I don't want to be accused of supporting McDonalds by any stretch, but I'm more interested in the breakdown of the meat itself rather than your bread. 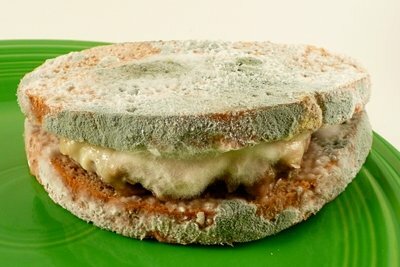 We all did the mold experiment in fourth grade and learned that wheat bread molds and decomposes faster than white bread and homemade bread more so than store-bought bread. 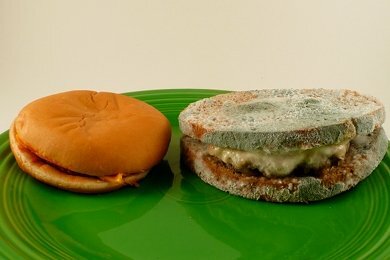 It seems to me that what we're looking at and reacting too is mold accumulating on your bread faster than the mcdonald's bun. What's the condition of the meat? Sadly we won't know because you threw out your burger. I think the bun's an interesting observation, but I'm more interested in the condition and quality of the food overtime versus the bun and how it compares to your burger. I have been a healthy eater for most of my life, particularly my adult life. I run marathons, don't eat very much processed food, etc etc. About 5 years ago when a family member of mine was in a horrific car accident I was in a small town and I couldn't go very far from the hospital. We drove around and were "stuck" getting some fast food. I tried to get the "healthiest" thing on the menu that would be somewhat filling, it was a non-fried chicken sandwich. I got sick almost immediately. Terrible stomach and intestinal pains and had to run to the bathroom if you catch my drift. I didn't feel better until it was no longer in my body. I don't think my body recognized it as food. I had eaten very occasional fast food as a child and been okay, but this was the first fast food I had had in years. It was terrible. I haven't touched a fast food meal since then. I was wondering what the Tostito's dietician had to say, can someone get this info to me? I just ate a BK Veggie burger last night and had the most terrible stomach ache. I have eaten these before, not very often, but what do you think about these? i hope Pollan and McD's respond...also would like to hear the response from the FritoLay dietician! Ironically, I just ate a McDonald's cheeseburger today. Luckily, I don't do it very often, but I feel like I should print the first photo out and keep it in my car to look at every time I get an urge for McDonald's.